Oaklandon People Appear. 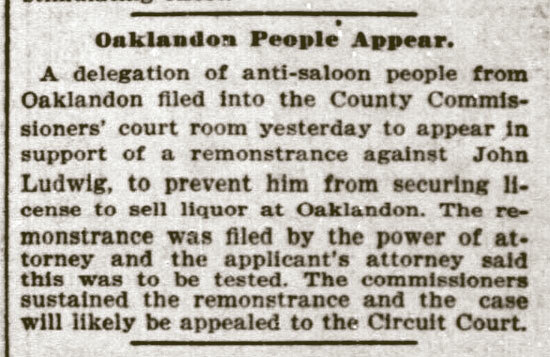 A delegation of anti-saloon people from ' Oaklandon filed into the County Commissioners' court room yesterday to appear in support of a remonstrance against John Ludwig, to prevent hlra from securing license to sell liquor at Oaklandon. The remonstrance was filed by the power of attorney and the applicant's attorney said this was to be tested. The commissioners sustained the remonstrance and the case will likely be appealed to the Circuit Court.